Yes I know you know this, and think it often. But how about her? Do you regularly congratulate her on being awesome? 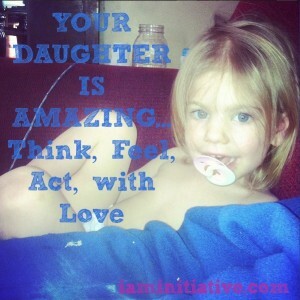 Here are some of the ways that your daughter is amazing. She goes to school every day and gets herself ready + out the door. She does her chores, helps her siblings out, takes care of her homework. She tries really hard to make things work, please you and impress you, and does the best she can. She is funny and often makes you laugh when you are feeling down. If you read these few short points and found yourself arguing back..
“well…she doesn’t do that, isn’t very good at that, I have to help her SO much with that, It takes repeated attempts to get her to do that, a shift in your perspective might be needed. She is going to think, feel, and act the way you teach her to think, feel, and act. If the way you show up and demonstrate for her is mostly negative, judgmental, and conditional…don’t expect anything different from her. If you struggle with this that is okay. Some things you might tell her like: “There is always room for improvement”, “Don’t give up with your first failure”, “Keep on keeping on”, all apply to you as well! Plus, I know you got this. You can be, will be, and in SO many ways already are, AMAZING at this parenting thing. You are going to make mistakes just like she is going to make mistakes.